The Gallery at 1GAP is pleased to present Rob Stephenson, Susan Hamburger, Kathryn Lynch, and Isidro Blasco in an exhibition about the contemporary Brooklyn landscape. In keeping with 19th Century art critic John Ruskin’s concept of “truth to nature”, the following artists are a heterogeneous group not inclined to romanticize Brooklyn, but rather present the city’s landscape as a place where visual harmony comes together only every so often. Ruskin emphasized the connection between art, society, and nature, in particular he championed painting directly from life rather than developing works in an invented studio setting, seeking art that seemed to be free of any rules of composition. Some of his writings predate the green movement by valuing land preservation and architectural harmony. He believed that architecture should be left to age, free of restoration, so as to display its inevitable changing form, an aesthetic he based on a kind of material truth. Susan Hamburger’s (b. Boston, 1962 ) installation in the Richard Meier designed building transforms a sleek black and white business setting into a sort of beaux-art drawing room. 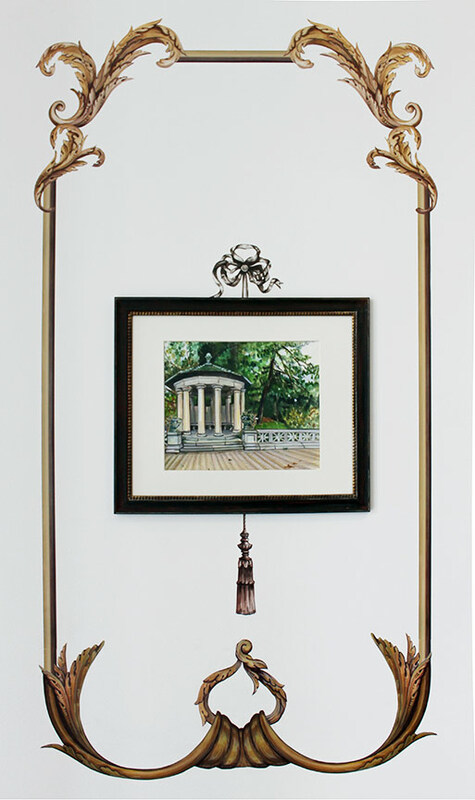 Hamburger treats the crisply skimmed walls with ornamental details and inlaid pastoral scenes of the fields and monuments of neighboring Prospect Park. 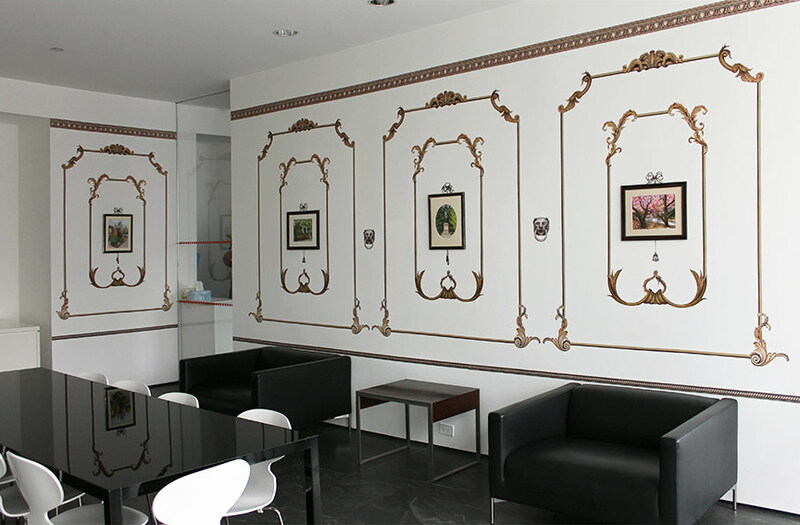 By using vinyl decals and trompe-l’oeil painting effects, her faux decorations draw attention to the surface upon which she works, in particular the Modern qualities of purity, harmony, and supremacy that seem baked into the Meier walls. By borrowing an older vernacular of interior decoration, Hamburger explores the vast shifts in taste that have taken place in and around Grand Army Plaza, effectively connecting the bourgeois past with the bourgeois present.